Thrilling, illuminating, heart-pounding. Liar, Temptress, Solider, Spy reads like a crackling espionage novel...Karen Abbott brings to vivid life four of extraordinary and audacious women, and runs glorious roughshod over all our traditional notions of the role of women in the Civil War. 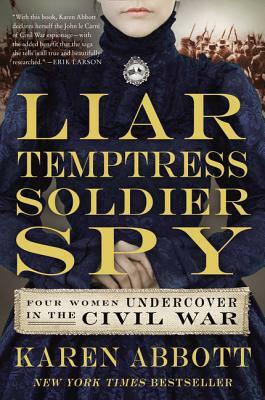 The subjects of Karen Abbott’s gripping story Liar, Temptress, Soldier, Spy leap up -- and almost off -- the page… an irresistibly good tale of Civil War espionage and a reminder that the heroes of our history are often found in the most unexpected places.